Billions of people suffer from poor governance – and this comes at a particularly high cost in the developing world. This column explores the opportunities to improve the accountability of elected and appointed officials via video recording technology. While there are legitimate privacy concerns, monitoring of the police, the judiciary and other public agencies has the potential to restore citizens’ trust in institutions that are essential for economic and social progress. Democratization does not produce good governance – that much should be obvious by now. Free, multi-party elections with vigorous media coverage and debate still result in governments ‘drenched in corruption, patronage, favoritism, and abuse of power’, as American political sociologist Larry Diamond wrote more than a decade ago. He added: ‘There is a specter haunting democracy in the world today… bad governance’. The consequences are enormous, especially in the developing world. While we may worry about attacks on the rule of law by Western leaders, the most vulnerable societies are in countries where governance was never good in the first place. Governance makes a huge contribution to development. Where it works well, citizens enjoy fair, impartial access to public services and resources; confidence in institutions is high; individual rights are protected; and economic performance is enhanced. So what can we do to improve governance? Skeptics doubt the efficacy of institutional or policy reforms, especially where a ‘rule of scofflaw’ civic culture has deep roots. Many see governance as a collective action problem, rather than a failure of institutional design. Where corruption is the ‘expected behavior’, no one has an incentive to blow the whistle. But before throwing in the towel, let’s consider how technological change can foster accountability. Using cell phone cameras to record interactions with public officials has suddenly and dramatically raised the cost of tolerating impunity. Information can be shared so widely now that it implicates those who turn a blind eye as well as those who commit the act. Formal institutions such as access to information laws have done little to ensure rule-consistent behavior or accountability. Can video ‘sousveillance’ fill the void? It’s far too early to know. But video is a potential source of evidence where official wrongdoing is alleged – a kind of ‘direct transparency’, analogous to direct democracy. In effect, it is a street-level tool of governance. The Rodney King video in 1991 helped to lead to the conviction of two officers for civil rights violations. But until widespread cell phone use, this was a rare occurrence. Now such recordings are ubiquitous, and prosecutions of rogue police are mounting. Is this a good thing for accountability and governance? And can its lessons be extended to developing countries and to the public sector more widely? Courts and prosecutors in the US have mainly said ‘yes’ to the first question. On the second question, there are few if any answers. In a May 2012 letter to the Baltimore Police Department, the US Department of Justice supported the rights of citizens to record police officers going about their duty in public, arguing that it would foster confidence and accountability. In the same month, the US Court of Appeals ruled that an Illinois law prohibiting recordings of police in public was a violation of the First Amendment. The police and citizens are recording each other. A 2014 report on body-cams for the US Department of Justice pointed to reduced levels of abusive behavior, fewer complaints against the police, more transparency and accountability, and better evidence in criminal and administrative matters. But there are legitimate concerns about time limits on holding information, notice to citizens, and the potential breach of trust and privacy. Interpreting video recordings leads to its own uncertainties, and ethical considerations need to be taken into account. Discretion and privacy are important too. And what of public agencies more broadly? Let’s face it, this is not simply a story of police accountability. 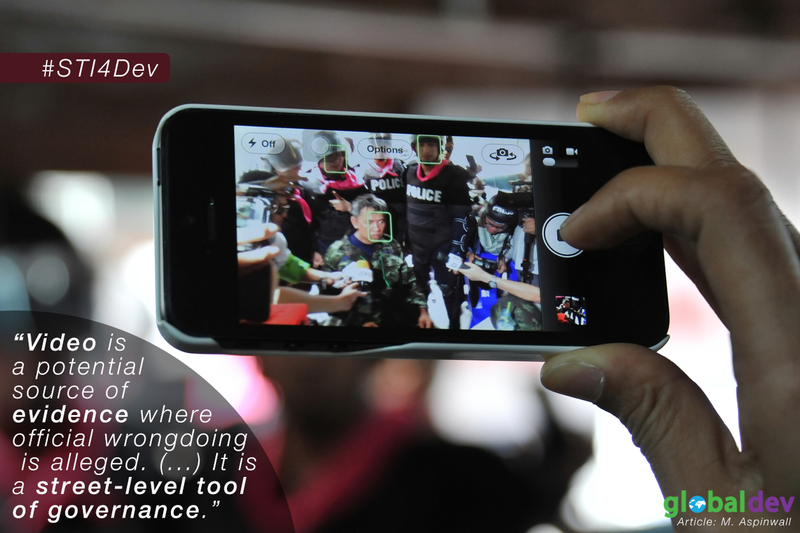 Video data could bring corruption to light, and reveal skills gaps and training needs. But would it work? Not if officials faced no repercussions, or avoided being recorded, or if there were so many corrupt officials that a ‘Where’s Wally?’ problem emerged. And what about developing countries? The present systems of information-gathering and monitoring in corruption-riddled countries leave much to be desired. Possible policy options include creating an independent video transparency office, responsible for gathering and filtering recorded information. Civil liberties and human rights groups, transparency NGOs, and the media, should be included to build trust and credibility. A data bank of recordings could be kept for future reference to counter endemic corruption. Decisions would need to be made about when and whom to record. Video recording may make more sense when the public service is generic (not tailored to the specific needs of an individual recipient). It may also make more sense when the individual recipient is entitled to the service simply by being part of a qualifying group (without having to demonstrate a personal capability or attainment). The same recording logic should be applied to the judiciary to ensure effective enforcement. Monitoring could be linked to professionalization by including training, changes to recruitment practices, career progression, salaries and other incentives, Officials could find themselves part of more respected and more trusted public agencies even as their own careers are enhanced. These steps may seem heavy-handed, but Stasi-style surveillance is not the problem for the billions of people who suffer from poor governance. Instead, it is the state itself that needs to be monitored. Citizens need more tools to oversee their elected and appointed officials. Mark Aspinwall is Professor of International Studies and Chair of the Department of International Studies at the Centro de Investigación y Docencia Económicas (CIDE) in Mexico City. He is also Honorary Professorial Fellow at the University of Edinburgh, Scotland.